Some people really like my work and have seen nearly all my videos. Some people are curious about my work and have clicked on a few videos and perhaps read a few blogs. Most people have some vague notion that I talk about anti-aging and telomeres and figure there will be time enough to learn about it if it turns out to be real. I have bad news for that last group; my videos and writings may soon be banned and you aren’t getting any younger or closer to understanding what really causes aging and disease. unless the representation is non-misleading, and, at the time such representation is made, Defendant possesses and relies upon competent and reliable scientific evidence to substantiate that the representation is true. The problem is that in my blogs, videos and lectures, I do cite reliable scientific evidence and I do believe my representations to be true. So I have to deny what I know in order to stay out of a protracted legal trouble. Who gets to decide what is reliable science if I agree to this gag order? Their paid experts. It is a bit like a self-criticism exercise by a Stalinist dictatorship. On point A (TELOMERASE and LONGEVITY), we know that a 50% gene dose of telomerase activity is the cause of premature aging and death as a teenager (as I explain in this video). I have never said and would not say that telomerase activation increases longevity but the US Patent Office did affirm telomerase activation from TA-65. and many papers point to increased telomerase activation being associated with cross-species enhanced longevity. (2013) Harley et al. A natural product telomerase activator as part of a health maintenance program: metabolic and cardiovascular response. (2011) Harley et al. A natural product telomerase activator as part of a health maintenance program. Keep in mind that a Harvard Study did show mice rejuvenation from telomerase activation and that the US Patent and Trade Office has agreed that TA-65 is a proven telomerase activator. (2011) deJesus et al.The telomerase activator TA-65 elongates short telomeres and increases health span of adult/old mice without increasing cancer incidence. On point D (HEALS CELLS)- we have no conflict as I believe telomerase activation preserves and helps provoke apoptosis of stem cells but I don’t believe it “heals cells” per se but rather causes existing stem cells to reproduce more efficiently, resulting in better organ repair. But that is still conjecture and stated as such in my work. The heart of my work, unpaid clinical case reports from my actual patients, is far from advertising for TA-65. In those videos that will be lost to public viewing if the FTC action is allowed, are sources of knowledge about basic physiology. I am proud to have treated each of the nearly 50 video podcasts with a ‘beginner’s mind’ and in doing so, I was able to discover truths that are constantly being validated. For instance, in my cholesterol podcast, I came to realize that high cholesterol is a secondary sign of inefficient cellular consumption. Now, scientists are reevaluating the wisdom of anti-cholesterol drugs. In that same video, I questioned the food pyramid and months later the USDA changed its carb-based food pyramid. In my hypertension podcast, I came to an epiphany that medical researchers still don’t accept: that hypertension is an adaptation to a need to perfuse given loss of arterial elasticity and contractility. In my many blogs about my stem cell theory of aging and disease, I have argued that telomere erosion from replicative senescence is the principle cause of aging and disease and decades from now, I believe this will be scientific orthodoxy. 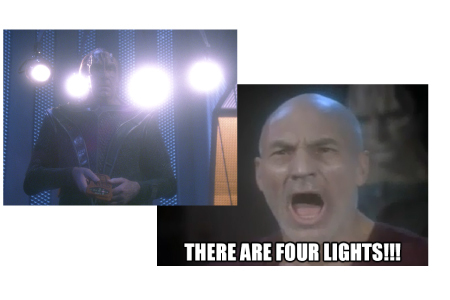 In one of the classic Star Trek: The Next Generation episodes, Captain Picard is kidnapped by the Cardassians (no not Bruce Jenner’s adopted daughters) and coerced into seeing three lights when there really were four. I can relate. Apparently 8 years of medical and public health training at Columbia and Harvard Universities and 23 years as a licensed medical doctor make my observations subject to to the anonymous and self-serving decrees of paid experts in search of a steady source of taxpayer largesse. If you have read my blogs and been educated, inspired, or amused, I would humbly ask you to give any amount for my thousands of hours of time spent trying to understand and explain truths that no one else is even attempting to make sense of.